Stitch Fix is using its data prowess across every aspect of its business to reinvent the $334 billion U.S. apparel industry. For consumers, it’s solving the discovery problem exacerbated by the endless sea of product online, where more than a quarter of clothes are now sold. Stitch Fix might have lost its luster on Wall Street for the moment, but the company doesn’t seem shaken. In fact, the online styling service says everything is going according to plan. 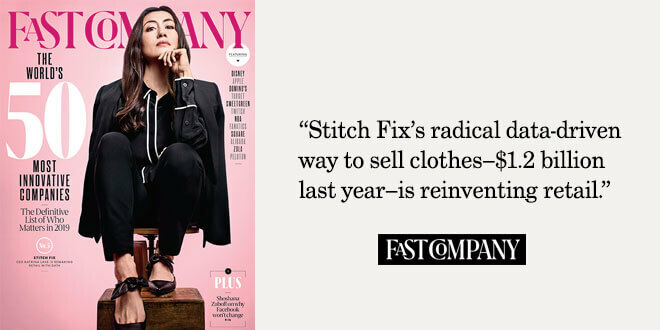 “We’re executing the vision exactly the way that we said we were and planned on,” said Mike Smith, Stitch Fix’s chief operating officer, in an interview with WWD. Oh, we know. The idea of navigating a shopping mall to revamp your wardrobe is dizzying. Thank Stitch Fix – the personal styling service was created with the plan to help men enhance their wardrobe from the comfort of their couch. Your personal stylist will send you a box of garments based on your fit, size, and style preference. Only 1 in 20 college degrees awarded today are in the humanities or liberal arts, as a perception persists that these fields don't provide marketable skills for students entering the workforce. But is this theory true? For our Future of Work series, Jeffrey Brown explores why students with "soft skills" are critical for innovating and helping organizations run effectively--even in Silicon Valley. With the high street in a state of malaise and established names from House of Fraser to Laura Ashley taking big financial hits this year, it was inevitable that new players would arrive to shake up how we might shop in the future. “I think that five years from now, we’re going to say things like, ‘Remember when we used to have to wander around stores to find our clothes? When we had to know how we fit in every brand? What was up with that?’,” says Eric Colson, chief algorithms officer at Stitch Fix. The San Francisco-based startup is one of a growing number of companies trying to combine artificial intelligence with a human touch to take on big retailers, both online and off. Stitch Fix counts 2.7 million active customers in the US and plans to launch in the UK in 2019. Katie Watts believes the role of the merchandiser should be entrepreneurial. Starting her career at Gap, Inc., Watts stepped over to the startup side when she joined Gilt Groupe in 2011. It was an exciting time exploring a new form of retail — the flash model — said Watts. But then Saks bought Gilt, and Watts’s role transitioned back to the traditional buyer’s. Data science can enable wholly new and innovative capabilities that can completely differentiate a company. Stitch Fix is building out its stable of brands. The San Francisco-based retail company, which was founded by Katrina Lake in 2011, has become a leader in personal styling services through monthly or on-demand boxes, effectively changing the way American consumers shop online. Initially, it offered a range of fashions for women, but as of two years ago, it branched out to menswear. Stay current on Stitch Fix News!